The economic recovery in the euro area and the European Union as a whole is now in its third year. It should continue at a modest pace next year despite more challenging conditions in the global economy. Against a backdrop of declining oil prices, accommodative monetary policy and a relatively weak external value of the euro, the economic recovery this year has been resilient and widespread across Member States. It has, however, remained slow. The impact of the positive factors is fading, while new challenges are appearing, such as the slowdown in emerging market economies and global trade, and persisting geopolitical tensions. Backed by other factors, such as better employment performance supporting real disposable income, easier credit conditions, progress in financial deleveraging and higher investment, the pace of growth is expected to resist the challenges in 2016 and 2017. In some countries, the positive impact of structural reforms will also contribute to supporting growth further. 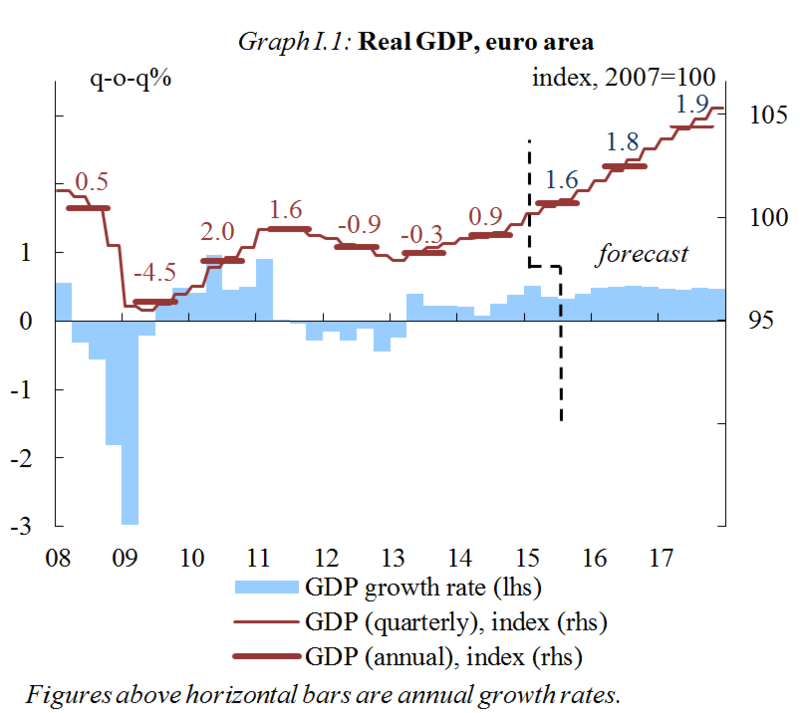 Overall, euro area real GDP is forecast to grow by 1.6% in 2015, rising to 1.8% in 2016 and 1.9% in 2017. For the EU as a whole, real GDP is expected to rise from 1.9% this year to 2.0% in 2016 and 2.1% in 2017. Domestic demand is strengthening in most euro area Member States this year and economic activity should rise across the EU in 2016 and 2017. Private consumption is growing as a result of rising nominal incomes and low inflation. Investment is also expected to strengthen somewhat on the back of rising disposable incomes for households, improving profit margins of corporations, favourable financing conditions and a brighter demand outlook. The labour market continues to strengthen at a slow and uneven pace across Member States. However, hard-hit countries that have implemented labour market reforms should see further gains in employment growth. In the euro area, employment is expected to grow by 0.9% this year and next, and to pick up to 1% in 2017. In the EU, employment is set to increase by 1.0% this year and 0.9% in 2016 and 2017. 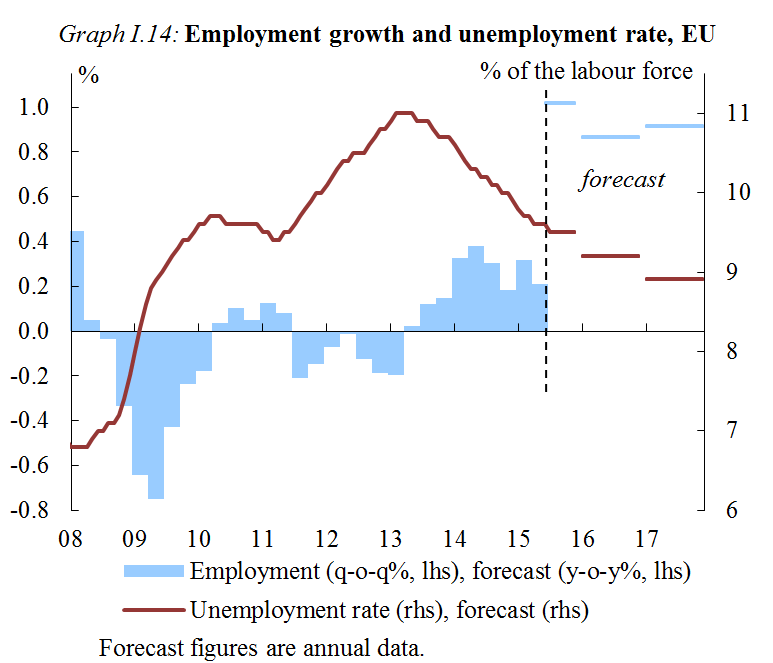 Overall, unemployment is expected to continue to decline only gradually, with substantial disparities between Member States. In the euro area, it is forecast to fall to 10.6% next year and 10.3% in 2017 from 11.0% this year, while in the EU as a whole, the forecast shows a fall from 9.5% this year to 9.2% and 8.9% in 2016 and 2017 respectively. 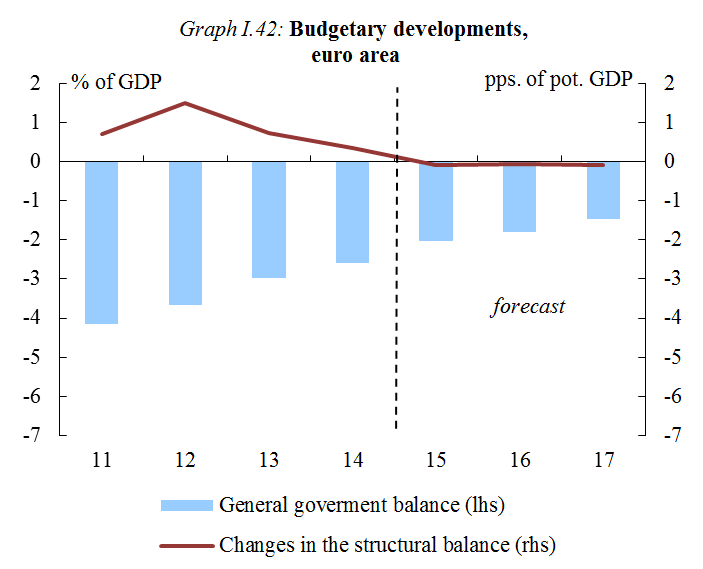 In 2015, the aggregate deficit-to-GDP ratio of the euro area is expected to fall to 2.0%, thanks to past fiscal consolidation efforts, the cyclical strengthening of economic activity and, to a lesser extent, lower interest expenditure. By 2017, the deficit-to-GDP ratio of the euro area should fall to 1.5%. The fiscal stance of the euro area is expected to remain broadly neutral. The euro area’s debt-to-GDP ratio is forecast to fall from its peak of 94.5% in 2014 to reach 91.3% in 2017. The deficit-to-GDP ratio for the EU as a whole is forecast to decline to 1.6% in 2017 from a forecast 2.5% this year, while its debt-to-GDP ratio is expected to fall to 85.8% in 2017 from 87.8% expected this year. The steep fall in oil and other commodity prices drove headline inflation in the euro area and the EU into negative territory in September. However, this masks the fact that wage growth, strengthening private consumption and the narrowing of the output gap are beginning to add increasing pressure to prices. 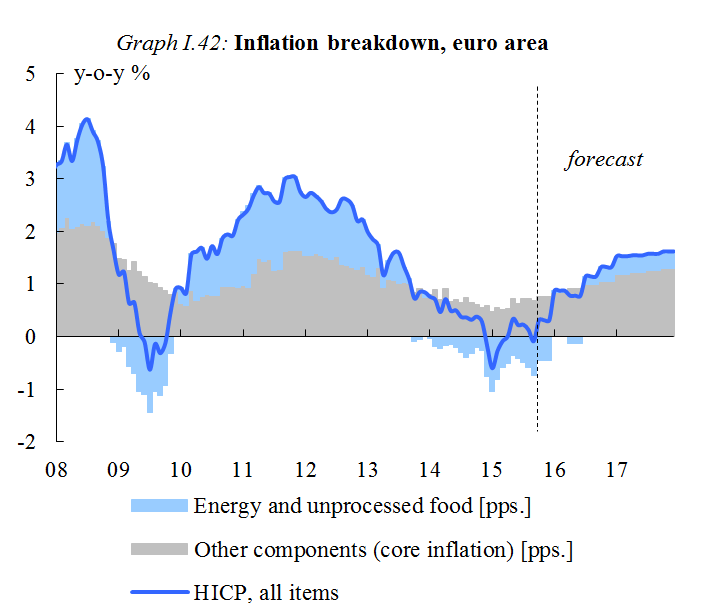 Annual inflation is expected to rise from 0.1% in the euro area and 0% in the EU this year, to 1.0% and 1.1% respectively next year, and to 1.6% in both areas in 2017. The outlook for global growth and world trade has deteriorated considerably since the spring, due to the downturn in emerging market economies, particularly China. Emerging market economies are expected to reach their trough this year and to start recovering in 2016. So far, euro area exports have largely been spared from the deterioration in global trade, mainly thanks to the euro’s past depreciation. However, export growth is expected to slow down in 2016 before rising slightly in 2017. This forecast provides a first assessment of the economic impact of the arrival of large numbers of asylum seekers in the EU. While in the short run, additional public expenditure increases GDP, an additional positive impact on growth is expected in the medium term from the increase in labour supply, provided the right policies are in place to facilitate access to the labour market. For the EU as a whole, the growth impact is small, but it can be more sizeable in some Member States. Risks related to the global economic outlook have increased. Lower growth in emerging markets, in particular a more disruptive adjustment in China, and the effects of expected normalisation of US monetary policy on emerging markets, could have a more negative impact on investment and economic activity in Europe than currently expected. This forecast takes into consideration all relevant available data and factors, including assumptions about government policies, up until 22 October 2015. Only policies credibly announced and specified in adequate detail are incorporated and projections assume no policy changes. This forecast is also based on a set of external assumptions concerning exchange rates, interest rates and commodity prices. The numbers used reflect market expectations derived from derivatives markets at the time of the forecast. The Commission is due to update its economic forecast in February 2016.